More than 400 people attended the Southwest Research Center field day on Saturday, Sept. 9. The field day featured presentations on numerous topics, including horticulture, beef and forages. With a focus on its diverse variety of research, the Southwest Research Center field day featured 20 speakers who presented on everything from pawpaws to seafood production. The field day, held Saturday, Sept. 9, also had several activities for children. This is the second year that Southwest has hosted its field day on a Saturday, focusing on bringing families to the Center. More than 400 people attended this year’s event. 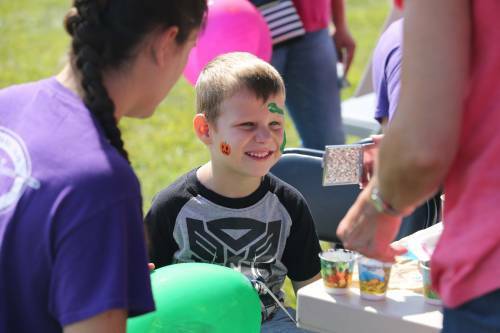 The Southwest Research Center field day featured several activities for children, including a face painting station. The field day featured four main topics – horticulture, beef, forages and general agriculture. The horticulture tour had the largest list of speakers, who covered blackberries, elderflowers, high tunnels, the vineyard, bees and mushroom cultivation. Andy Thomas, a research assistant professor who is located at Southwest, showed off all of the horticulture research via a walking tour and van tour. The beef tour focused on mineral supplementation and selecting cattle for profit. The forage tour had talks on Bermudagrass, novel endophtye fescue, baleage supplementation and managing pastures with new technology. The general agriculture tour had a unique group of presenters, with seafood production in the Midwest and a cannulated cow being featured. University of Missouri Extension played a key role in the field day. The majority of the speakers were Extension agents, including Jared Decker, Tim Schnakenberg, Reagan Bluel and Patrick Byers, among others. Eric Bailey also presented. Bailey became a state beef nutrition specialist with Extension in June. The field day also showcased an important partnership with Lincoln University. Shon Bishop, a horticulture specialist with Lincoln, has partnered with Southwest for several years on its high tunnel research. In addition to the presentations, there were numerous activities for children, including a grass maze, pumpkin picking, face painting and free balloons. Christopher Daubert, the MU College of Agriculture, Food and Natural Resources Vice Chancellor and Dean, was in attendance at the field day as well. He spoke during the Southwest Research Center appreciation dinner on Friday, Sept. 8 at the Center. Daubert began his duties on Aug. 1. For a closer look at the Southwest Research Center field day, visit: flickr.com/photos/cafnr/albums/72157686442554324.